Remember when I said I was ready to deal with all of the stuff that goes along with owning chickens? A week ago, the girls were out free ranging. Two of our chickens didn't come home that evening, and they are presumed dead. We don't even know what happened to them, although that's probably a blessing, because having the image of their torn-apart bodies in my brain would make this even worse. 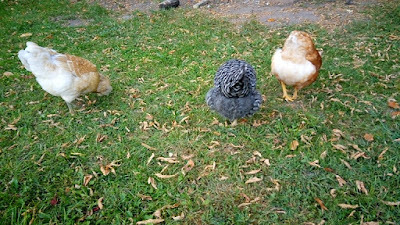 It seems very strange for two of them to go missing together--chickens are so skittish, there's no way a single predator would be able to get two of them. Nevertheless, they are gone. I'm trying to take comfort in the fact that they had a good life. It's not working very well. It's the guilt. The other chickens seem to be adjusting to their new normal. 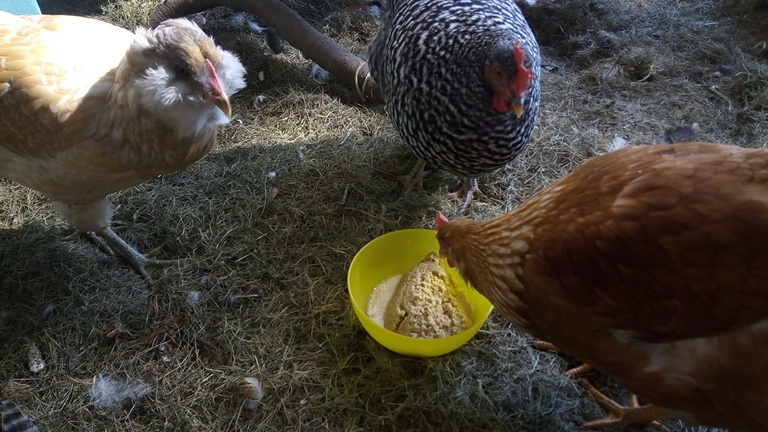 Here they are eating some fermented feed. Well, two of them were--Esther kept pecking at the bowl--it was the first time I used a yellow bowl for their feed, and she wasn't quite sure what was happening. Before the tradgedy, the girls introduced themselves to the family of deer that frequents our back yard. In other news, we found something eggstra in the nest box on Saturday. It was pretty eggsciting. We think that part of the yolk didn't make it into the egg (here's how an egg forms)--we're postulating that's what the yellow stuff is to the left of the egg (the "egg" on the right is a nest egg). 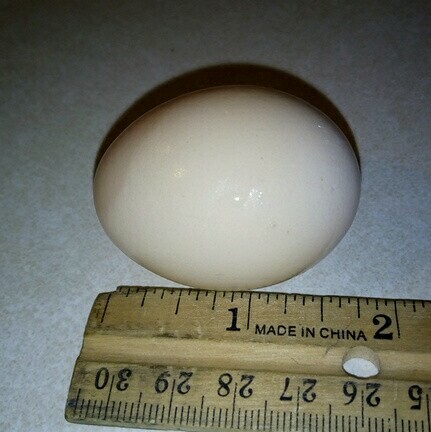 I'm amazed and impressed that this egg appeared in the nest box. 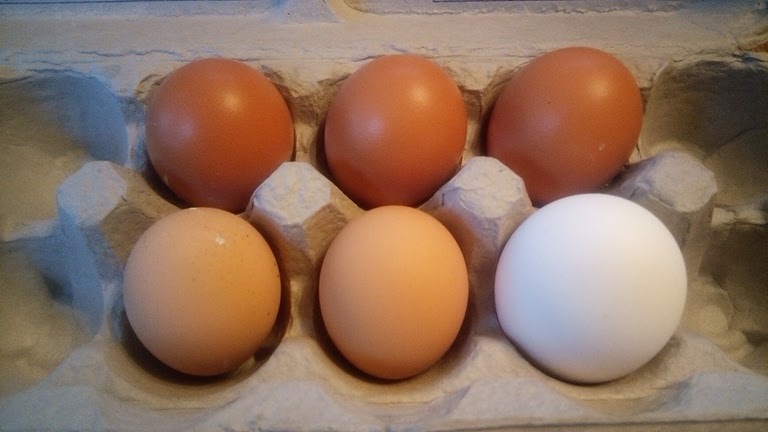 I mean, we put the ceramic eggs in there to show the girls where eggs go, but if they've never laid an egg before, how do they know that there's an egg coming out? Such clever girls. It was a cute little egg, as first eggs often are. 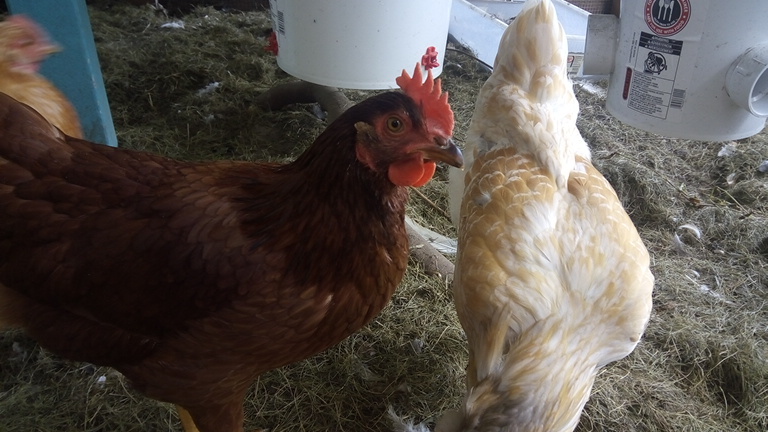 We think Rocky laid this egg, because her comb and wattles are the reddest and she was the only one who had been doing the submissive squat, but since we didn't catch her in the act, we're not sure. Rocky. That chair in the background is where I sit to watch the girls (it's usually on the other side of the coop, but I move it around to get the best view). I've heard of chickens being used as therapy animals and I can understand why. Poor Esther--the confinement is taking its worst toll on her. She paces frantically back and forth in front of (or is that behind?) the door whenever I approach the coop. Makes sense, since she's descended from jungle fowl. Esther kept wanting to photobomb with her fluffy cheeks. No wattles and her pea comb is still pink. Toasty Crunch, looking prehistoric. 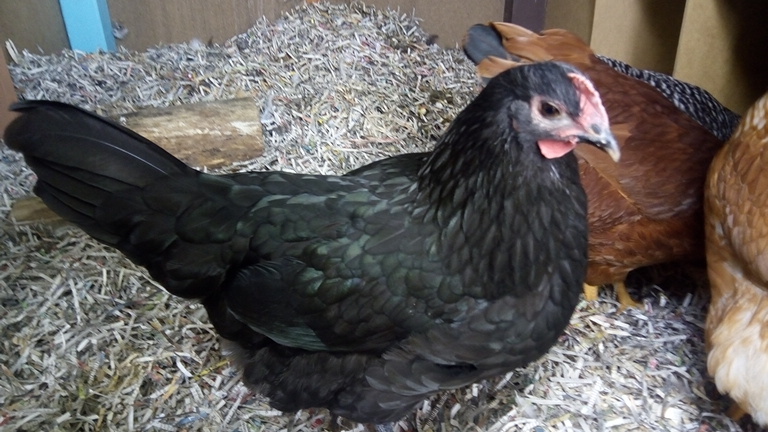 Just in the past week her wattles have gotten bigger and her comb has gotten redder. She did the submissive squat for the first time on Sunday. On Tuesday morning, Toasty greeted me with a loud bok, bok, bok-bok, baaaaaawk, as I walked out to the coop. It seemed like she was trying to tell me something. Turns out she was. Now these are the weird, misshapen, thin-shelled eggs I was eggspecting for the girls' first eggs. I think Toasty's is the oblong one, for various reasons. Two chickens laying, one to go! We're crossing our fingers for blue or green eggs from Esther.